Nikon's Coolpix S6500 combines Wi-Fi connectivity with a 12x optical zoom lens and a 16 million pixel sensor, all of which enable it to both compete against and complement a smartphone camera. The 16 million pixel back illuminated CMOS sensor of the Coolpix S6500 is significantly larger than a typical smartphone sensor. The larger surface area and back illuminated sensor technology should enable the Nikon S6500 to produce better images than the smaller smartphone sensor, particularly in low light. Another key feature of the Nikon Coolpix S6500 is its 4.5-54mm f/3.1-6.5 lens with 12x optical zoom. This is the equivalent to a 25-300mm lens on a camera with a full frame sensor. To reduce camera shake, especially when used at the longest extension of the zoom, the lens is fitted with Nikon's Vibration Reduction technology. The third key feature of the camera is its Wi-Fi connectivity, which enables the Coolpix S6500 to be connected to a smart device such as a phone or tablet. Once connected, you can share images to the device or use the device as a remote viewfinder and control, which is ideal for taking self portrait or wildlife images. Images taken using the Nikon Coolpix S6500 are saved as JPEG files, and there's a variety of different scene modes to choose from, to make sure images are correctly exposed. Because the Nikon Coolpix S6500 is a consumer-level compact camera, it doesn't have any manual exposure modes. However, the brightness of the exposure can be adjusted using the camera's exposure compensation feature, and it is possible to select an ISO sensitivity from between ISO 125 and ISO 1600. When using the auto ISO mode, the camera can also automatically select ISO 3200. Images are composed using the 3 inch 460k dot TFT LCD rear screen, which is an acceptable resolution for a camera of this level. In use the screen is good. It has a good level of contrast and pleasing colours, and its anti-reflective coating works well. Only in extremely bright sunlight does it become a little more difficult to see the screen. There are five different levels of screen brightness, and we found that increasing the brightness from level three to five helps you to see the image on the screen a little better on a bright day. The Nikon Coolpix S6500 has a full price of £229.99 / US$219.95 / AU$289, putting it at the same price point as the Canon IXUS 255 HS. 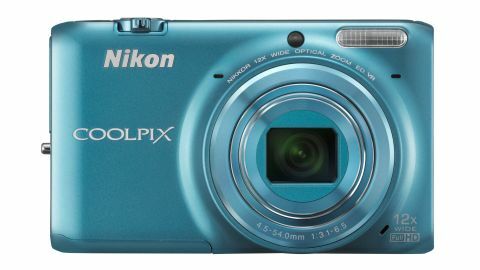 The Nikon Coolpix S6500 has a stylish plastic body, that feels solid and well built. The camera is a nice size, small enough to fit in a trouser pocket, yet large enough that's the placement of buttons doesn't feel cramped. The button arrangement of the camera is fairly straightforward and should be familiar to anyone that has used a compact camera before. On the rear is the standard arrangement of buttons placed around a directional control pad, with a direct video record button on the top right of the rear of the camera. After pressing the power button, the Nikon S6500 takes just over second to switch on before you can take an image. The Live View screen is fairly comprehensive, displaying such details as the current shooting mode, ISO sensitivity, battery life and the shutter speed and aperture setting. With little in the way of manual control, you're restricted to having the camera set to either an automatic mode or one of 19 scene modes. In addition there is an automatic scene selector which detects the scene being photographed and changes the settings accordingly. In the standard automatic modes there are a number of changes that can be made to the exposure and shooting settings, including the flash mode used or ability to switch the macro focusing mode on or off. You can also set a self timer of either two seconds or 10 seconds. The camera's main menu is extremely simple in terms of both design and layout. The large icons and text make the on-screen menu items easy to read, and there are enough settings that can be changed to satisfy the needs of most compact camera users. Connecting the Nikon S6500 to a smart device using the camera's Wi-Fi connectivity is fairly simple. Simply go to the Wi-Fi settings in the utility menu and turn the Wi-Fi on. This can only be done if the camera's battery is almost fully charged. Otherwise the Wi-Fi option is disabled, because it can drain battery life. To connect the Nikon S6500 to a phone or tablet, you must first download Nikon's Wireless Mobile Utility application to your smart device from either the Apple Store or Google Play Store. Connecting the camera to the device is simply a case of finding the camera on the Wi-Fi settings of the phone and tablet and then opening the app. With the camera connected, you can now use the device to either remotely take photos or view the contents of the Nikon S6500's memory card. Once familiar with connecting the Nikon S6500 to a smartphone or tablet, it is extremely straightforward to transfer images between the camera and device, making it possible to share images taken with the camera while on the move. Most users will use the Nikon Coolpix S6500 in its Matrix (evaluative) metering mode. In most situations the evaluative metering mode produces exposures that are a little too bright. This also causes colours to look a little washed out. Adjusting the exposure compensation to reduce the brightness of images by -0.7EV produces better results, with darker shadow areas, which in turn results in a better level of contrast and slightly more saturated colours. We would also recommend that most photographers switch to the vivid image style to really add some punch to their images. With the exposure compensation set to -0.7 EV, the evaluative metering works very well in a variety of situations. Whether in macro mode, shooting a landscape on a sunny day or exposing a very dull woodland scene, the metering produced a pleasing exposure. For more awkward scenes, spot and centre-weighted metering are also available. In its default colour setting the Nikon S6500 produces good, realistic, colours, though they perhaps lack a little saturation that makes them really stand out. The automatic white balance setting does a reasonable job, though as is common with other cameras it can remove slightly too much of any dominant colour. Compared to the the AWB setting, using the Sunlight white balance setting on a bright summer's day produces images with more vivid greens and blues. Similarly, using AWB in a woodland scene removes some of the green colour. Of course this is what the AWB setting is designed to do, so in this regard it works well. But to get the best possible colours from the camera we would always advise using the default white balance settings rather than the automatic option. The Nikon Coolpix S6500 has five of these settings, as well as a manual white balance control. At the lowest ISO 160 sensitivity there is very little noise visible. However, the lack of very fine detail and textures indicates that some luminance noise reduction has taken place. With a resolution of 16 million pixels, those who print their images should be fairly pleased, with the results up to around A4 (US letter) in the size. Beyond this size, close inspection reveals the lack of detail. The effect of the noise reduction system gets stronger as the sensitivity increases. At ISO 400 some luminance noise becomes visible along the edges of objects in the image. This is typical of in-camera noise reduction, where the noise reduction algorithm tries to preserve sharpness by applying a weaker noise reduction effect along edges of objects in the image. At the maximum sensitivity of ISO 3200 there is quite a significant loss of detail, noise reduction, as well as some signs of JPEG artefacts. What is very impressive is that throughout the entire ISO sensitivity range of the Nikon Coolpix S6500 there is virtually no colour noise. The only evidence of colour noise that we could see was the smallest hint of a slight purple bruising in the shadow areas of a selection of images taken in a dark woodland. There is also no chromatic aberration, although on a few high contrast edges there was a slight hint of purple. This provides evidence that any purple fringing is being reduced in-camera. The 25-300mm lens of the Nikon Coolpix S6500 is good, and images are almost as sharp at the edges as they are in the centre, particularly when the lens is used at its shortest focal length. With only the merest hint of curvilinear distortion at either end of the zoom range, it is obvious that any distortion is corrected in-camera. The lens focuses at a good speed, particularly in bright sunlight. However, when focusing in more subdued light the speed is moderate, without ever being snappy. In macro mode the focusing is slower, presumably to ensure that at these very close distances the focusing is as accurate as possible. There is a range of different focusing modes available, each enabling you to set different AF areas. These modes including Face Priority, Target Finding AF, Centre AF area, as well as manual AF selection. However, the most useful AF mode is Subject Tracking, which quickly enables you to select a subject to focus on with the subject tracked should it or the camera move. Again, there is enough variety in the AF modes to satisfy the needs of most compact camera photographers. When shooting full resolution images, it can take around two seconds to save the photo and get the camera ready to take the next shot. In Continuous High shooting mode the Nikon S6500 can take seven images at speed of 10fps, with the camera then taking around six seconds before it can be used again. A lower 2fps rate is also available. If you want really high speed images then it is possible to shoot at 120fps, but at a much reduced 640 x 480 pixel VGA resolution, and 60fps is possible at 1 million pixel resolution. Video is captured at Full HD 1080p resolution at 30fps, with sound recorded in stereo. The quality of the video itself was quite good, though fast panning shots did suffer a little from slanting verticals. Also, the lens seemed to have some trouble focusing when we tried to zoom in while recording. At wide focal lengths it was alright, and slowly found focus once zooming had stopped, but at longer focal lengths all of the footage was out of focus. Although the sleek design of the Nikon Coolpix S6500 may be what causes many to pick it up off the shop shelf, it has many other attractive features. The 12x optical zoom lens works well, focusing quickly and retaining sharpness at its edges. The in-camera processing also ensures that images are free from chromatic aberration and curvilinear distortion. The camera also handles well. It is easy to use with a clear menu layout, and the Wi-Fi connectivity is equally straightforward and easy to use. On the whole images are bright and colours are good, especially if you reduce the exposure slightly. However, the noise reduction is a little heavy, particularly at lower ISO sensitivities. We would like to have seen more detail, particularly at ISO 160. That said, there is very little in the way of colour noise at any ISO sensitivity, and Nikon should be applauded for this. With compact camera sales on the decline, due to the dominance of smartphone cameras, the compact camera market is now an extremely competitive arena. Nikon's Coolpix S6500 will compete with the likes of the Canon IXUS (Canon PowerShot ELPH in the US) range, which will provide it some tough competition. When the size and zoom range of the Nikon S6500 is combined with Wi-Fi connectivity, it makes for a great travel zoom camera. The exposure metering tended to overexpose slightly, and the noise reduction is also a little strong, particularly at low sensitivities. With a current street price of around £150 / US$170 / AU$215, the Nikon Coolpix S6500 is good value for money for those photographers who understand the advantages of a compact camera over a smartphone camera. The Wi-Fi functionality and 12x optical zoom lens make it an ideal companion to take with you on your travels. However, more advanced photographers may be a little frustrated by the lack of manual exposure control.